The new bridal collection of Katia Delatola is called “The Circle of Life”. It is inspired by the Dervishes and touches a more spiritual part of the whole wedding process. Having movement as the principal axis for her bridal designs, Katia Delatola’s dresses undeniable take shape when the bride is walking and especially when she is dancing! The materials that she mainly used in this collection are hand frayed silk georgette, Chantilly lace from France and silk layered tulle skirts. Dresses for a bride that follows the trends in fashion and wants to wear a wedding dress that reflects her femininity. As the designer mentions: “The concept of preciousness is something that I tried to incorporate in my collection with just the right amount of feathers, lace embroidered with rustic sequins and laces. For her dress finishing I used lace and gross grain ribbons”. The new element in the collection are the Deux Pieces, the skirt-blouse –two piece wedding dresses; a new trend that many brides are following since it gives them greater freedom of movement. 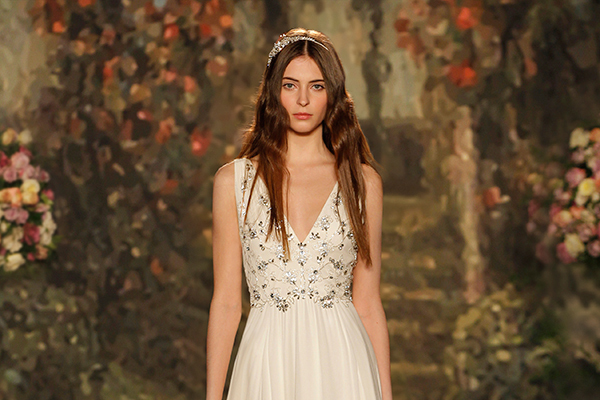 A remarkable collection of romantic bridal dresses and vintage gowns for a modern bride. The designer emphasizes about her new bridal collection: “I have an image that I wish every bride can live; a free spirited spinning around herself; so she can really feel the joy of the new life, of the new circle of her life”.